'Thanks for being here, it’s like a deja vu experience. We had a good time last time and we’ll try and do it a little differently for you tonight,' Young told the crowd after opening with a tune unheard in November, When You Dance, I Can Really Love, and a spirited Are You Ready for the Country, with Ben Keith’s lap steel guitar floating over his fearless leader’s pounding on a battered upright piano. There were other, fresher treats in store, like a stripped-down version of Pocahontas, marked by Chad Cromwell’s tribal drumbeat, and a raggedy Barstoon Blues, which provided a moment of levity when the band started one song and Young another. 'Well, what do you want to do?' he shrugged at Cromwell with a note of mock exasperation. 'Well, OK, we’ll do both of ’em. 'This is like rehearsals for retirement, only we don’t want to get it down,' Young told the crowd, which was cheering with encouragement. 'We always don’t want to be ready for that. 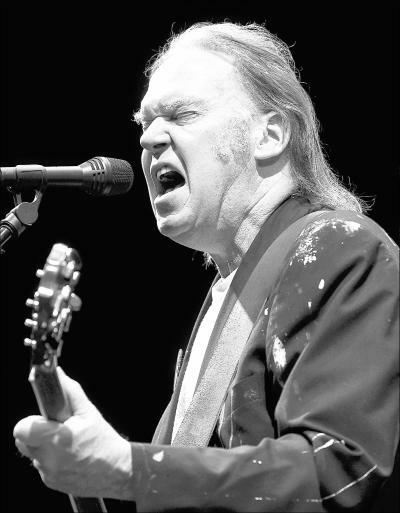 Neil Young will be performing tonight at Metro Centre, Halifax, Nova Scotia, Canada. Just got back from the show, I am speechless except for one word: Pocahontas. Add Spirit Road, The Needle and the Damage Done and Change Your Mind. I know there were more too. He played a long show. I was front and center, a few feet back from the fence. My second favorite show I've seen in Hali. Pearl Jam, 220905. My favorite show in Halifax. Download the torrent, amazing setlist, amazing show, and the second encore ended with Fortunate Son and Rockin' in the Free World. It was fantastic, that made three shows in six months for me. He's really playing off the cuff. Changing things on the fly the whole shot. Thanks Neil! Neil is certainly playing from many albums, Freedom, Harvest moon, Sleeps with angels, Hawks and doves.....I think when you look at the albums he's pulling from, this tour is rich in sound. He is digging deep.Everybody knows.., Tonights the night, Rust never sleeps, Harvest, Chrome dreams, Ragged Glory, Fork in the road. You've gotta dig it. Lets hope he hasn't settled in yet and keeps mixing them come London!! Theres my bit for the day. "This is like rehearsals for retirement..."
Please, don't say that, even in joking, Neil! FITR gains more presence. Some great setlists. There is no way he can retire man... he might retread, but he won't retire! Hi.Me and my wife will be seeing him in Kelowna. We have GA tickets. What I would like to know is what has the crowd been like on the floor? Is it out of control ore pretty peaceful.I can take a rowdy crowd but my wife cant.God I hope he does Hurican when we see him. Seems to me that Neil is just going through the motions. That was a nothing version of Love And Only Love he did as an encore.Like he couldnt wait to get it over with. 'Like a Hurricane' was the encore. I don't think he played 'Love and only Love' Friday (he opened with that in November). Another song he played was 'The Ways of Love' from Freedom. Amazing, amazing show. Except for the people behind me who reported me to security for standing up and rocking during Barstool Blues and Heart of Gold. Sorry, but it's a rock concert and it was only 2 songs! My brothers travelled here and are still raving about the show. I don't think Neil was in a rush to get out -seemed like he was never gonna stop playing and rocking hard. F*&%$K!!! What DID we do wrong in Sydney!!! Great show. This was my 7th and one of the best.Loved all the surprises and variety.Lost in space. Change youre mind.Speakin out.And of course A great version of Pocahontas.All were excellent.Thanks again Neil. Here's the set list from the April 10th show. Two or three songs might be slightly out of order, but they're all there. Amazing show. Neil culled songs from all over his impressive career. Hope everyone enjoys. D.F.....Yeah, like 8 SONGS MORE THAN at SYDNEY!ent cent.....The viagra kicked in hard on this one heh! What a long ,diverse and satisfying set list that would have been!! The "setlist police" will be on to this for sure!! !